Laser engraved Orthodox Cross Necklace made from olive wood that has been pruned during the trimming season. this wooden orthodox cross necklace is made by talented wood artist in Bethlehem. you can buy it for yourself or give it as a gift to someone you care about. Each Cross comes with a cord and a certificate of authenticity. This star of Bethlehem necklace is a creative cross shaped like a star with a heart in the center that represents the love that God gives us everyday in our lives. the necklaces could slightly differ from each other that goes back to the fact that it is made from olive wood and each branch has it own uniqueness and color. Dimensions: 3 cm / 1.18"
Each Star Pendant is comes with a cord and a certificate of authenticity. 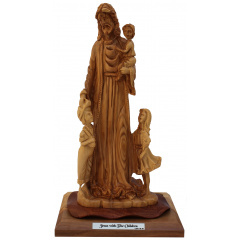 Jesus Christ Body while he was crucified is astonishingly engraved on olive wood made in The Holy Land with love. Each Crucifix Cross Pendant comes with a cord and a certificate of authenticity. In Christianity the Holy Spirit or Holy Ghost is the third person of the Trinity, the Triune God manifested as God the Father, God the Son, and the God the Holy Spirit; each entity itself being God.The dove is an emblem of purity and harmlessness (Matthew 10:16), and the form of the dove at Jesus’ baptism signified that the Spirit with which Jesus is one of holiness and innocence. Our Wood Pendant Jewelry is laser engraved made from Olive wood in the Holy Land and it is a special gift for someone receiving the Sacrament of Confirmation. Laser engraved Olive Wood Cross Pendant from pruned olive wood. this Roman Cross is made by talented olive wood artist in the holy land. buy it for yourself or gift it to someone you care about. Each Olive Wood Cross Pendant comes with a cord and a certificate of authenticity. Laser beautifully engraved catholic cross from olive wood that has been pruned during the trimming season. this cross pendant is made by talented wood artist in the holy land. buy it for yourself or gift it to someone you care about. Each Olive Wood Cross Necklace comes with a cord and a certificate of authenticity. Laser engraved cross on olive wood pendant made by talented wood artist in the holy land. It is a thoughtful gift for your loved ones . This wood carved pendant is a proper gift for someone receiving the Sacrament of Confirmation. Celtic Cross is a Latin cross first originated in Ireland and Scotland. Some people believe that the ring around the cross represents the halo of Jesus Christ and some say it stands for the Roman sun-god Invictus. Nowadays this cross is used on graved stones and in funerary monuments. This Beautiful laser engraved Celtic cross Pendant is made from Olive wood in the Holy Land and can be a special gift for your loved ones. * Each Celtic Cross Pendant comes with a certificate of authenticity. Length: 3 cm / 1.15"
"You are looking for Jesus the Nazarene, who was crucified. He has risen! He is not here” Mark 16:5-7. This Olive Wood Cross pendant is laser engraved with INRI Latin letters that mean "Jesus the Nazarene, King of the Jews" (John 19:19). 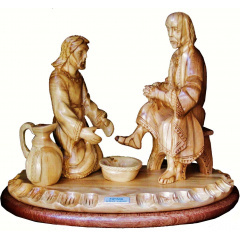 It is unique manufactured in the Holy Land from Olive wood and comes with a certificate of authenticity. is a Catholic cross first originated in Ireland and Scotland. Some people believe that the ring around the cross represents the halo of Jesus Christ and some say it stands for the Roman sun-god Invictus. Nowadays this cross is used on graved stones and in funerary monuments. what distinguished this Celtic cross pendant that it has the holy spirit carved on a shape of dove that means purity. This Beautiful laser engraved Catholic cross Pendant is made from Olive wood in the Holy Land. Laser engraved of Bethlehem olive wood. Laser engraved decorative cross necklace made of Bethlehem Olive wood, olive wood is rich in color and veins which are the main characteristic of its beauty. The grains may differ from one cross to another as this is the nature of the wood and which also makes every cross unique. Dimensions: 5cm * 3.3cm / 2.15" * 1.3"
This crucifix necklace is made of genuine Bethlehem olive wood and perfectly designed so that the center of the cross is round where the medals are placed. The medals and the Corpus are manufactured at our foundry in Bethlehem, Bethlehem Casting Co., cast of Zinc alloy and Silver coatedwith antique silver polish. The St Benedict crucifix is a Catholic necklace with two medals, one medal on the front side and another on the backside which are rich in meaning. The backside medal contains an image of St. Benedict holding a cross and his book of famous monastic rule. On his left and right are words meaning, The cross of our holy father, St. Benedict. The outer edge contains the words in Latin, May we at our death be fortified by his presence. The front side medal contains the initials of a Latin exorcism prayer, as well as a prayer for guidance. Surrounding the outer rim of the front are the letters V R S N S M V S M Q L I V B. These letters stand for an exorcism prayer based on an incident from St. Benedicts life. Dimensions: 8cm * 5cm / 3" * 1.95"
Laser engraved necklace made of Bethlehem Olive wood, olive wood is rich in color and veins which are the main characteristic of its beauty. The grains may differ from one cross to another as this is the nature of the wood and which also makes every cross unique.